You don’t need to be a prepper to want to know about wild plants and how they can benefit you and your family. Nature, in her wisdom, has provided an abundance of good things to eat and wild medicines for us to use. There are also plants that provide us with tinder, building materials, and even water. Learn the appearance of each plant with care, as some have look-a-likes that can be hazardous if consumed. A simple walk through a forest will bring you up close with potentially life-saving plants. 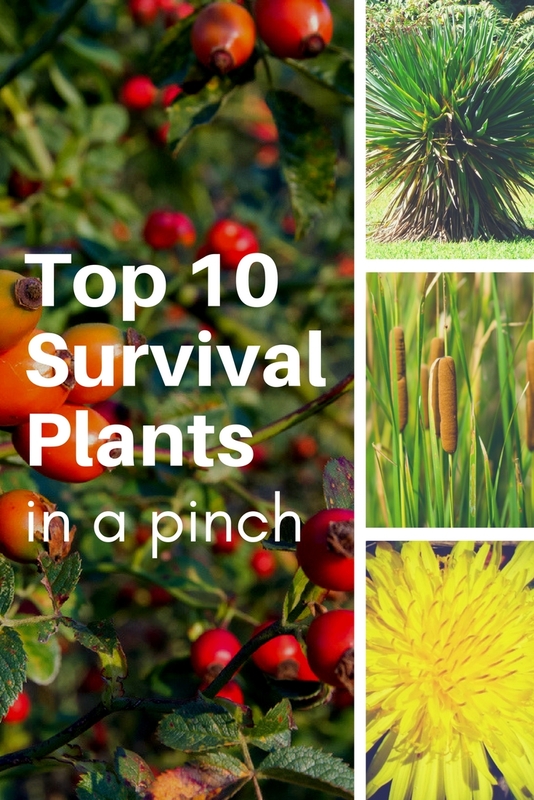 These top 10 survival plants should help get you out of any pickle and provide you enough fuel to scavenge other food and water sources. 1. Dandelion – All you may need to do to find a dandelion is look at a crack in the sidewalk. These common herbaceous plants are tasty in salads, soups and as tea. The leaves are also a diuretic, an appetite stimulant and digestive aid. All parts of the plant are edible, even the fuzzy petaled heads. Use roots as you would any root vegetable, young leaves in salads and older leaves blanched as a hot vegetable. The roots can also be roasted and ground to make a substitute for coffee and the flowers make a fine wine. In spite of the plant’s association as a weed, dandelions have Vitamins A, B, C and D plus plenty of iron, potassium and zinc. 2. Rose Hips – Many varieties of wild roses, or Rugosa, develop “hips.” These are the portion of the flower behind the petal that swells and contains the seeds. Once dried, the hips can be used in tea. Fresh hips are used like any fruit in preserves and sauces. Rose hips are very high in Vitamin C, a good nutrient to keep the immune system strong. As a medicine, rose hips can help with stomach problems, gall bladder ailments, UT and kidney issues, and possibly lower cholesterol. These marvelous fruits even taste slightly citrusy and have a wonderful scent. 3. Cattail – Anywhere water collects, such as ditches and along waterways, you can hope to find cattails. Their fuzzy long heads resemble corndogs but they are far more nutritious. You can eat the roots, the young stems and the female flower head. You can boil, roast, steam or eat raw the roots, which also are made into flour. The tender young shoots at the base of the plant are juicy and sweet raw or sautéed. The flour may be eaten just like corn on the cob. Best of all, spent flowers make downy tinder, insulation or bedding. 4. Wild Onion – Wild onions look like their domesticated counterparts. They are also easy to confuse with Camas, whose root is also edible. However, Death Camas, with its yellow flowers, is deadly, so be certain the plant you choose has an oniony smell before you try it. Wild onions flavor soups, stews, meats or can be eaten raw. 5. Thistle – Thistle is easily recognized by its toothed leaves covered in fine hairs and sharp spikes. The young leaves are delicious when blanched, but older leaves are tough and it is difficult to remove the hairs. The inner stem is edible, as are the roots. The flowers can be eaten much like artichokes. This plant may take some preparation but it is filled with vitamins and minerals and literally grows like a weed. You can keep a steady annual supply by simply allowing one flower to ripen and send out the downy seeds to repopulate the area. 6. Hawthorn – Low growing plants are not all that you can find on which to survive. Hawthorn trees produce fruits called haws. You may prepare these as you would any berry in preserves, sauces, desserts, wine, tea, or as a candy. The young leaves and new buds are excellent in salads, casseroles or made into a sauce similar to pesto. Traditional medicines used the dried fruits as digestive aids and modern research has shown some potential in treating cardiac disorders. 7. Birch – While not as easy to harvest, a tapped birch tree can produce up to 18 gallons (68 litres) of sap. When boiled for a long period, this becomes a tasty syrup that has a long shelf life. You can turn this into wine or vinegar for preserving. The youngest shoots and leaves should be cooked but can introduce the vitamins A, C, E, B1 and B2 to your survival diet. Traditionally, infusions were used to treat kidney and urinary tract ailments. The bark contains saliycilates, which are effective in treating warts and other topical issues. 8. Yucca – Depending upon where you live, yucca may be abundant. The root has a potato-like starchiness when roasted and can also be dried and turned into valuable flour. It is high in carbohydrates, fuel that drives much of the day’s activities. It is also high in fiber, foliates, potassium and Vitamin C. The roots contain saponins and antioxidants that have been used to treat arthritis and other joint problems. 9. Amaranth – This is one of those ancient grains everyone is talking about and is native the Americas. The leaves contain oxalic acid, which can be annoying to some, so boiling is suggested. Amaranth seeds are gluten free and naturally contain more protein than rice or other similar foods. Seeds can be roasted and eaten or ground into a flour. Studies are showing the plant may also reduce blood pressure. 10. Purslane – Another plant that most gardeners view as a weed is purslane. It is high in Beta Carotene and Omega 3 fatty acids. Leaves and stems may be cooked or eaten raw and have a cucumber-lemon flavor with a back taste of pepper. Purslane livens up stews, salads, sandwiches and many other dishes but, best of all, you can find it almost anywhere. The tiny plants have moisture rich leaves which can help parched travelers if eaten raw.